Two-truck platooning is an emerging technology designed to boost fuel economy performance for tractor-trailers engaged in long- and regional-haul highway applications. Platooning combines existing commercial vehicle safety technology with emerging vehicle-to-vehicle communications and autonomous vehicle control technology to electronically “tether” tractor-trailers together in a convoy formation at highway speeds. Once a platoon of trucks is established, the vehicles, safety systems work in unison to draw the trucks together at significantly reduced following distances to overcome each vehicle’s inherent aerodynamic drag. Fuel savings depend on many factors. At a 40 – 50 ft following distance directionally, the front truck can save 4% on fuel and the following truck can save 10%, giving an average of 7% (versus the two trucks not platooning). The fuel savings of two-truck platooning is likely a 4% average savings over the two trucks in real-world operating conditions after accounting for traffic, terrain and time when equipped trucks will not be operating in a platoon. Comments about platooning center on things like the timeline for its implementation, fuel savings, following distances, driver acceptance, driver pay, cost, and platooning with other fleets. The study team developed two tools to help fleets make decisions about two-truck platooning. The Payback Calculator uses upfront cost of the equipment, any subscription costs for platooning, the savings in fuel, etc. 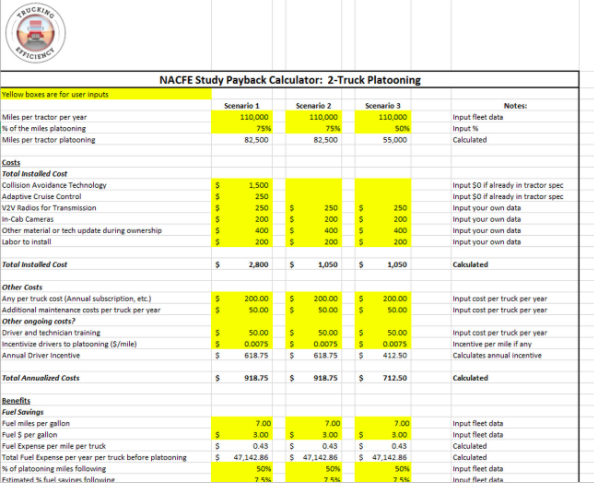 to calculate the payback of two-truck platooning. 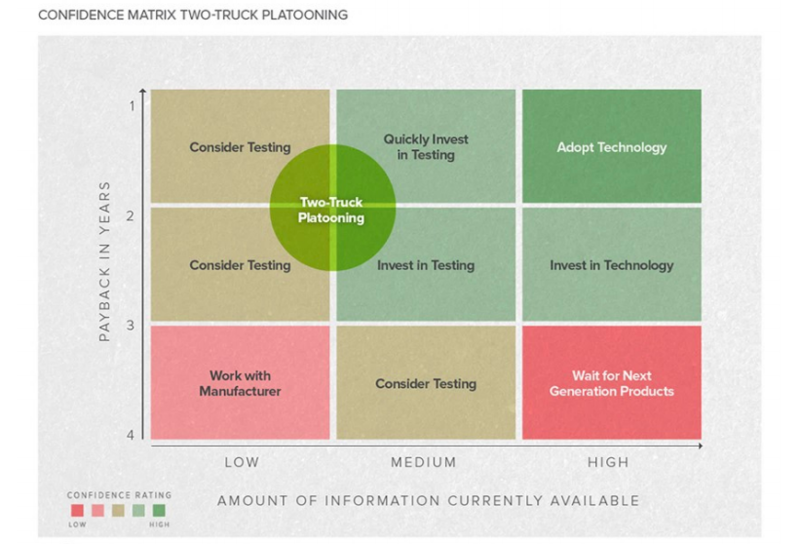 The Confidence Matrix plots where the two-truck platooning choice falls in terms of available data on the technology and how quickly fleets should realize payback. The fuel savings of two-truck platooning is likely a 4% average savings over the two trucks in real-world operating conditions after accounting for traffic, terrain and time when equipped trucks will not be operating in a platoon. The bulk of the required technology is currently available and being purchased by many fleets. Intervals of 40 to 50 ft. will likely have sufficient payback for early adopting fleets and then shorter distances, with their higher fuel savings, can be implemented with product improvements. Two-truck platooning is not fully autonomous/driverless trucking and it is actually being improperly grouped with that concept. Driver stress will likely be less than perceived to date. Platooning will accelerate the adoption of other technologies such as collision avoidance and adaptive cruise control.